A trundle around the supermarket of life. 070910-1, originally uploaded by MollsMusings. I'm guessing that the stuff at the top won't give the right vitamins. 070910, originally uploaded by MollsMusings. Have you ever collected a trolley or basket at the supermarket only to find a screwed up piece of paper wedged in the metal at the bottom? Have you ever picked up that piece of paper and read the words written there? People leave these slips of their domestic arrangements without a second thought - but they say so much about their author - and not just what they will be having for dinner on Tuesday evening. 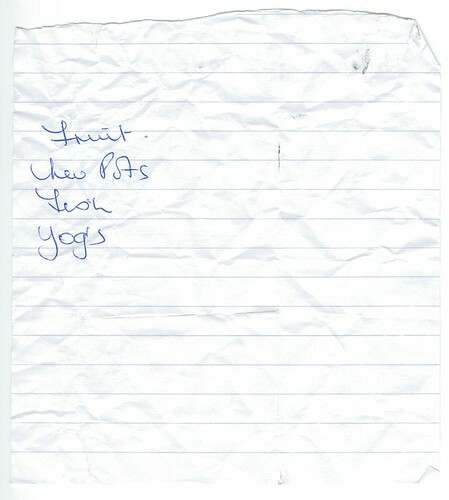 I've been collection shopping lists from various supermarket chains up and down the UK for a couple of years now. They are fascinating (go on, have a look - they really are), not just a list of grocery items. How they are laid out, how things are abbreviated, when someone is obviously following a recipe and how they choose to mark an item when they have picked it from the shelf. 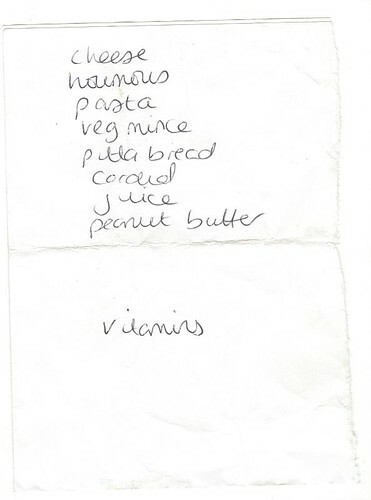 I bet you never thought about these insignificant scraps of paper - be careful what you leave behind at the supermarket, it says more about you than you might think!